Leigh Harbour is a keyhole fishing port. 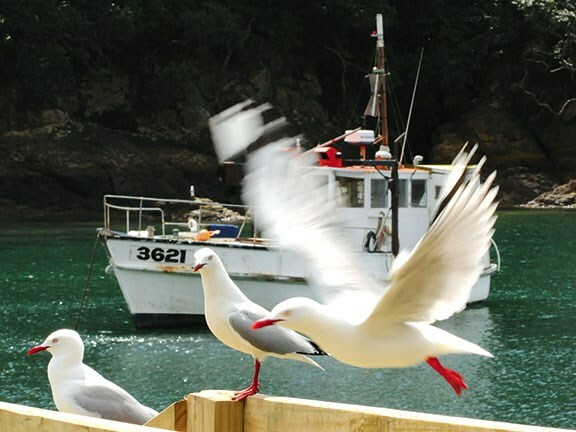 Seagulls waiting for fishing action at Leigh Harbour. 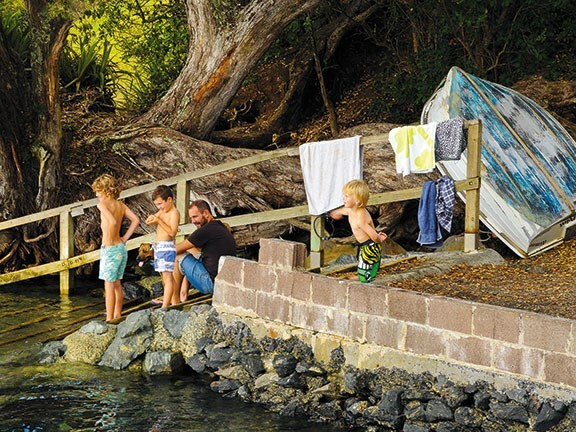 Family fun and summer swimming near Ti Point Wharf. Heritage cottages at the top of Leigh Harbour. A New Zealand green gecko at the Reptile Park. The path winds along the coast under giant pohutukawa. 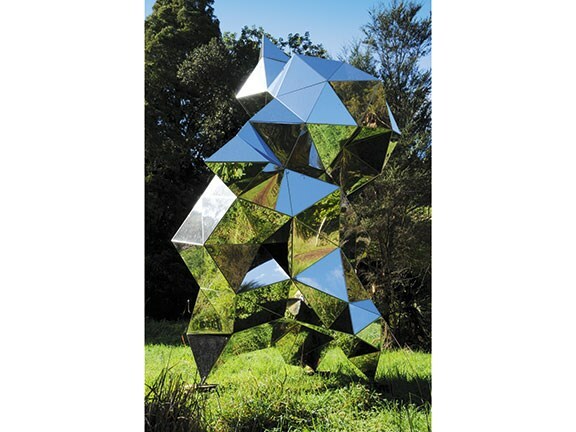 Gregor Kregar’s reflective Polyhedron at Brick Bay. Leon van den Eijkel’s giant child’s windmills at Brick Bay. Happy resident Liz Light reveals the Matakana the locals know and love. 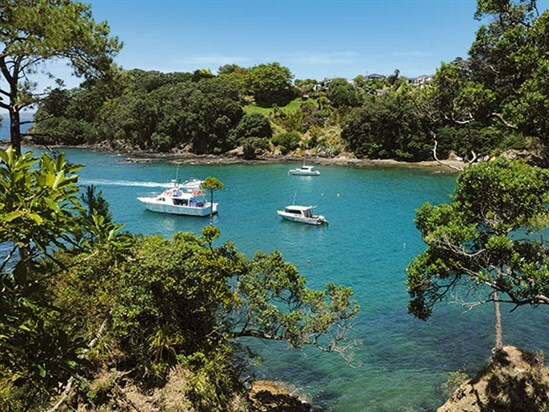 But don't be deterred by Matakana's often over-popularity, it has secret outlying attractions most city day trippers miss — and one of them is the Reptile Park. How often does one get to see a tuatara, a family of chameleons or, if one looks closely and with patience, 13 different types of New Zealand lizard? There are also 16 turtle and tortoise species, alligators, and exotic lizards that closely resemble dragons. At New Zealand's only reptile park, located on the road between Whangateau and Leigh, one can see all these creatures and more. Children and grown-ups alike love it. I'm particularly interested in, and delighted to see, the New Zealand lizards which come in two types — geckos and skinks. 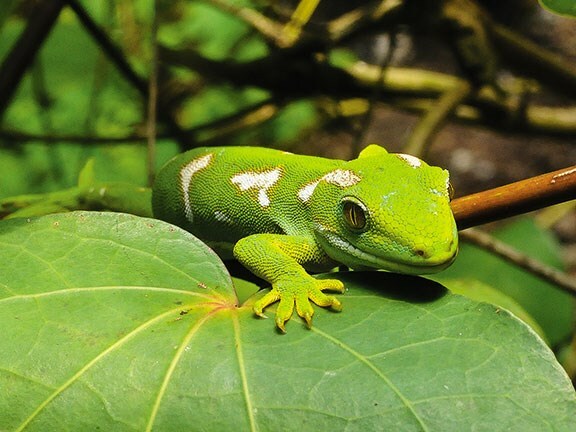 When I first peer into the leafy cage labelled 'green gecko', I see nothing but plants. Then some of them move. Soon I can see a number of bright green geckos perfectly camouflaged. They have frog-like eyes, little legs with long fingers and tails and they are very, very pretty. The lizard story is a sad and dwindling one. Of the 76 species indigenous to New Zealand, three are known to be extinct, eight are now only found on predator-free islands and over half of the other species are endangered. Cats, rats, weasels, stoats, and humans are the main culprits majorly messing-up the environments they thrive in. The dinosaur-like tuatara is a hit with visitors, as are the much bigger and grander dragons from Malaysia. Alligators lie on the edge of their pools and don't move but there is plenty of action in the tortoise areas. One female lays eggs and another pair are mating, ever so slowly. Just down the road, Ti Point Wharf is a sweetie, as is the walk from here north along the coast. We park near the wharf, which is busy being an au-natural playground for herds of children. They play under and over the dinghies that lean on a steep bank and are secured to pohutukawa trees, and they jump off the wharf at high tide, swimming around to the steps to jump again. 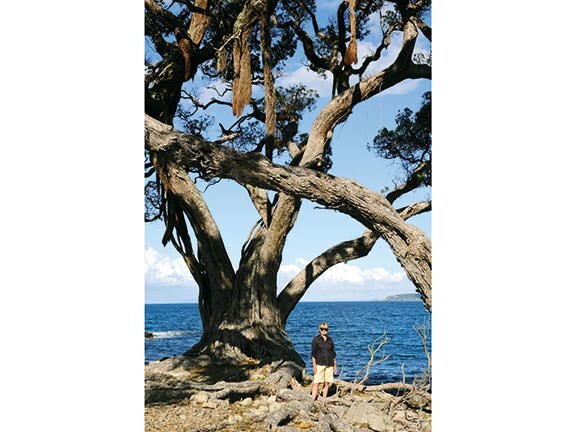 We leave them and their supervising parents and follow the path from the wharf to the mouth of Whangateau Harbour and then north up the coast, as it weaves under and around ancient pohutukawa. 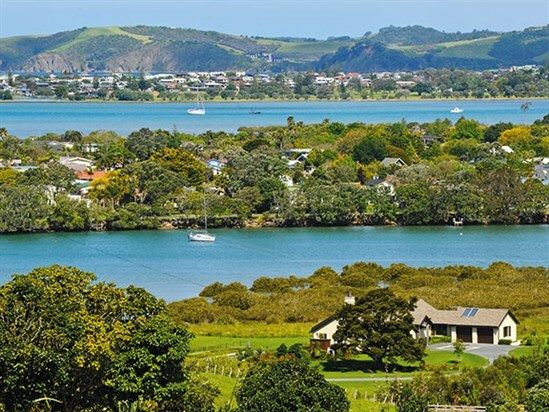 There are stellar views across the harbour to the sweeping golden crescent of Omaha Beach, where Auckland's super-rich people own mansions they casually call 'baches'. Outside the shelter of the bay, waves worry rocks and Little Barrier Island, with her usual cloud-cap, is centre-view. This delightful and little-known coastal walk is worth the two-hour return trip. 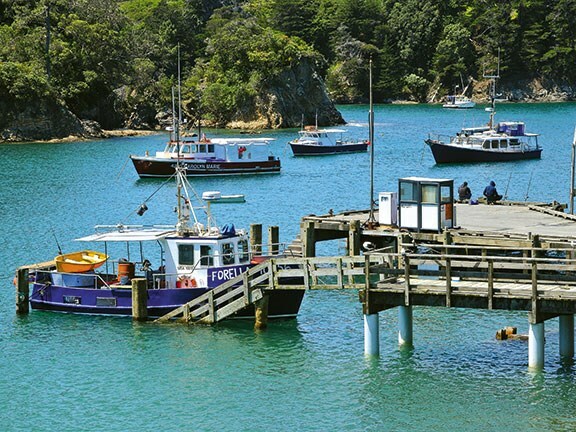 Further north, Leigh Harbour is in a cosy cove with fishing boats, ice trucks and fishermen coming and going. And, usually, locals fishing off the wharf are happy to chat about what's biting. When I finish fishy rubber-necking, I follow a path inland, around the harbour and past two classic heritage cottages. The path ambles along the bottom of a steep bush-covered hill and ends at a perfect little sandy bay. Tui sing, shoals of tiny fish flick away when I paddle and gannets dive for big fish deeper in the harbour. The water is so still and clear that I can see my toenails when I'm up to my neck. It's another secret slice of heaven. Leigh's other claims to fame are the Sawmill Café & Bar (see the fact file for details) and Leigh Marine Reserve (officially known as Cape Rodney-Okakari Point Marine Reserve). Here, with a mask and snorkel one can eyeball schools of snapper, rock cod and numerous other fish species. I have enjoyed swimming and snooping here in this pristine underwater landscape many times in the summer months but, be warned, the visibility is bad when there is an easterly or northeasterly wind. 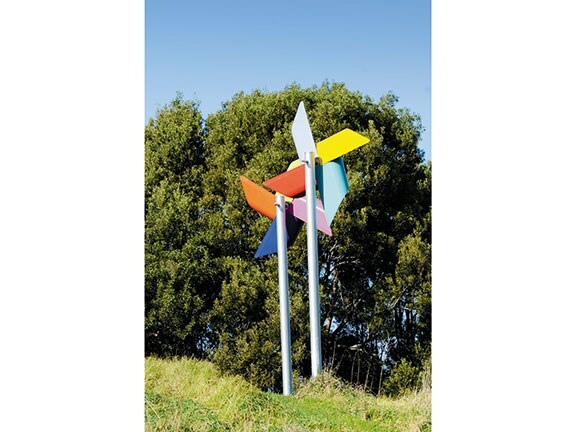 For those interested in art (and wine), Brick Bay Sculpture trail has the work of 45 contemporary New Zealand sculptors. The adjoining winery and café is cantilevered over a lake and it's pleasant to soak up the sun, sip wine and share a plate of antipasto while dragonflies helicopter by. The water sculptures in and beside the lake, taking advantage of the reflection, make an interesting backdrop. The sculpture trail is two kilometres of uphill-down-dale and it takes us over an hour to walk around it. Each piece is generously spaced and appropriately placed. I have favourites — Leon van den Eijkel's giant windmills based on the bright, colourful fairground windmills-on-a-stick that we used to enjoy as children, and Gregor Kregar's Brick Bay Polyhedron. This five-metre mathematical sculpture looks like a blown-up molecular structure. It's hard-edged and geometric and its many shiny flat surfaces reflect the soft lines and dappled textures and colours of grass, bush and sky. The walks and wineries, the art, the pretty harbours, and gorgeous beaches are some of the many reasons why I love Matakana. Never mind that Matakana village is sometimes an overcrowded victim of its own popularity, for there is still plenty to do and see beyond it. Ti Point walk takes one hour each way. Park where the road ends by the wharf at the end of Ti Point Road. The turn-off is just north of Whangateau village on the Matakana/Leigh Road. 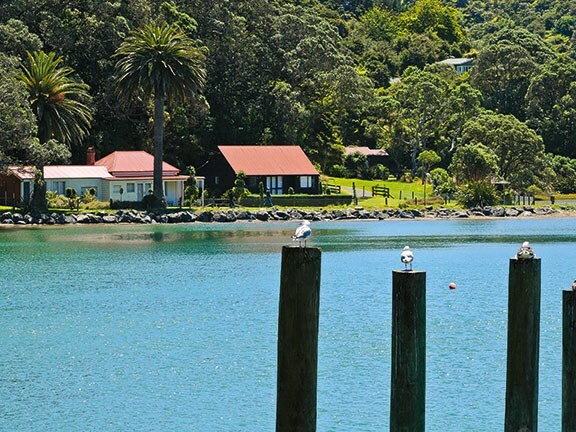 Leigh Harbour is 13 kilometres north of Matakana. The harbour walk to the beach on the north side of the harbour takes 20 minutes.